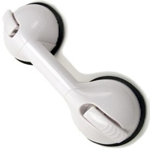 Portable, quick and easy to install, this Suction Cup Balance Grab Bar adheres to any smooth surface without the use of tools or the damage of drilling. Provides the ideal amount of balance stability and assistance whether at home or while traveling. For use on the shower wall, next to a bathtub, or near a chair or a stairwell for better balancing. Made for single hand or double hand use. Quickly and easily adheres to the smooth surface of your choice. Just pull back the release levers, position bar, and close the release levers in place. 4.5 inch diameter suction cups provide superior adhesion to the smooth surface. Available in one fixed length and three telescoping lengths. Available in white only. 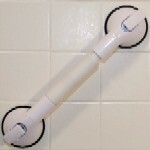 Three year warranty on grab bar and one year warranty on suction cups. Caution: This grab bar is to be used for balance purposes only. Not constructed to withhold body weight. 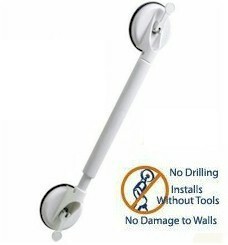 Compare this product with the Quick Suction Rail. While far more costly, the suction on this model is far superior to that of the Quick Suction Rail.